Men's and women's national hockey teams will face their fans in new team uniforms at the Olympic Games in Sochi. 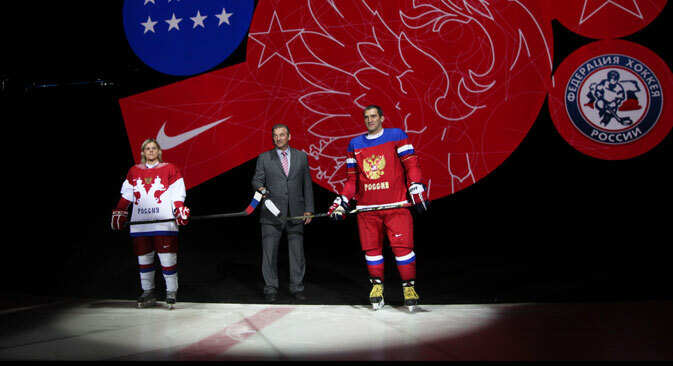 Alexander Ovechkin, the forward for the men's national team of Russia, and Alexandra Kapustina, the women's national team defender, introduced the new Russian ice hockey Olympic team uniform at Sokolniki Ice Palace in Moscow. The uniform has a large Russian coat of arms on the front, with eight stars on the shoulders and eight crowns on the sleeves. “I hope this new uniform and the success of the team that will play in it will enter into the history of Russian hockey,” said Vladislav Tretiak, president of the Russian Ice Hockey Federation. The designer of the uniform, Ken Black, spoke about its advantages. According to the designer, the main advantage of the new equipment is its lightness. “The uniform is 10 percent lighter than it used to be! This is important, because, if a hockey player feels uncomfortable and begins to think about his jersey, he stops thinking about what is happening on the ice,” said Black. The white visitor uniform is also a special point of pride. It was presented by the defender of Russia’s national team, Alexandra Kapustina. The contours of the eagle are drawn in red on a light background, adding elegancy to the uniform. “We, the girls, and even the men, do care what we wear on the ice. I love this uniform,” said Kapustina. Alexander Ovechkin praised the new design, as well. “I’m proud of my country and am always ready to play for Russia above all else. I love the design of this new uniform. The eight stars on the shoulders of the red uniform honor the past victories. This is also a symbolic number for me; I'm playing under number eight,” he said. Based on materials from Gazeta.ru and Rossiyskaya Gazeta. Gazeta.ru: Do you feel any excitement before the Olympics? Alexander Ovechkin: There’s no excitement, so far; I think this will come closer to the Games. Of course, when you play at home, the whole country, even your parents are watching you; so you're going to feel some pressure, but you must ignore it. All you need is to go onto the ice, play hard and win. Gazeta.ru: Could you compare the level of this uniform in Russia and in the NHL? A.O. : This uniform is different from that in the NHL. The cloth is different, the pattern. Here we have the coat of arms, there —the team logo. These are quite different things. The uniform must be light. Gazeta.ru: ESPN has made a rating of NHL uniforms; the Washington uniform is only in 28th place. Does this disturb you? A.O. : It might be even in 30th place. I don’t care. Gazeta.ru: What do you think about your trip to Sochi? A.O. : I’m impressed. We rarely see facilities in the process of construction. We were shown the facilities that will host the opening and closing of the Olympics, the sports palace, the ski slopes. We saw the Olympic Village, visited the restaurant. Of course, all of this was unforgettable. Gazeta.ru: Where are the dressing rooms better: in Sochi, Turin, or Vancouver? A.O. : In Vancouver, we were given the guest dressing room. They provided us with everything: There was a gym, bicycles. They did their best to make us feel comfortable. Gazeta.ru: Did they ask your advice when choosing the design? A.O. : (Laughs) No, they didn’t—I’m no designer. Gazeta.ru: Tell us about the preparations for the season. A.O. : My coach from America came here. During the last two weeks I have been training with Dynamo on the ice and in the gyms. Dynamo players helped me, of course. I made a call and asked the club’s management to allow me to train in the gym, and they allowed me to use the ice. They were very helpful. Gazeta.ru: Would you like to be in New York at the U.S. Open now? A.O. : Of course I would like to be there, but what can I do: I have so many activities right now. I'm flying to the U.S. on September 24. Gazeta.ru: Who will win in the men's and women's tournaments? A.O. : I think Djokovic will win in the men’s tournament. While in the women's... well, I would like to see Kirilenko win (Smiles). Gazeta.ru: Mikhail Grabovski will be playing in Washington. What do you think of this? A.O. : Now there are three of us Russians. There will be someone to speak Russian with. Of course, I know him, but we haven’t socialized much. Gazeta.ru: How did you spend the summer? Where did you rest? A.O. : I traveled to Turkey, France and London. Everything went well. By the way, I traveled to France to see Maria Kirilenko at the tournament.